LTH Home > Chat > Gardening, Farming and Foraging > Cicadas, anyone? So, as a new gardener, I have become slightly obsessed with the coming of the 17 year cicadas, which are more likely than not going to emerge in our parts come late may and hang around for a month or so. I know they can cause damage to trees, but haven't been able to find any real information on other plantings--late May being prime planting season on the Island. Anyone with memories of 1990, care to share your experiences? And perhaps more relatedly, anyone planning on eating the winged morsels? Tips? Recipes? PS : Much more and much creepier information (including sound samples) can be found here. Last edited by kl5 on April 25th, 2008, 12:39 pm, edited 1 time in total. These are commonly eaten in Mexico. Called chicharras after the sound they make, I've had them fried with onions in a little butter and olive oil until crunchy and then dressed in some lime juice, Worcester sauce, salsa Cholula, salt, pepper, etc. I recall they weren't as good as grasshoppers (chapulines), but they were O.K. Not something you would spend 17 years missing. 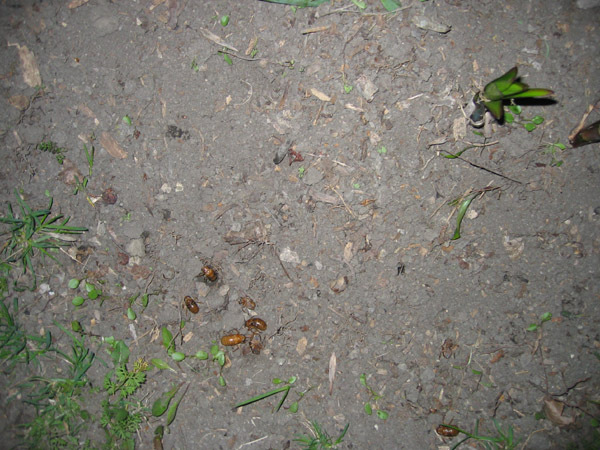 Cathy2 on March 12, 2004 wrote: 17 year Cicadas coming soon - how to cook? We are approaching that time again, the emergence of the 17th year Cicada in May. On the last occasion, there were cicada pizzas, cicada candy, cicada stir frys, toasted cicadas ... but I only learned they were edible rather late in the cycle. I have been assured a well prepared cicada tastes rather nutty. We have two months to prepare ... what advice either factual or anecdotal can people offer. There are specialized journals for just about anything, so why not eating insects? If you scroll down, there is an article on the last 17th year invasion in Chicago including recipes reprinted from the Chicago Sun Times! Though I would limit my consumption as an excess of chitin, which your stomach may not be able to successfully digest, may cause stomach upset. Feeling like stretching the envelope? Why not try the toasted grasshopper chocolate chip cookie at the bottom of this website? Of course, I could go on and on. However, I'd like your input on edible insects. especially our pending Cicada invasion! I have relatives in Mexico who consume insects, larvae and such without any reservations. I collect wild mushrooms for study and consumption, some I like and others a mere taste is enough. I would not normally consider eating insects, simply because there is some effort to collect grasshoppers or some hunting to find ant nests. 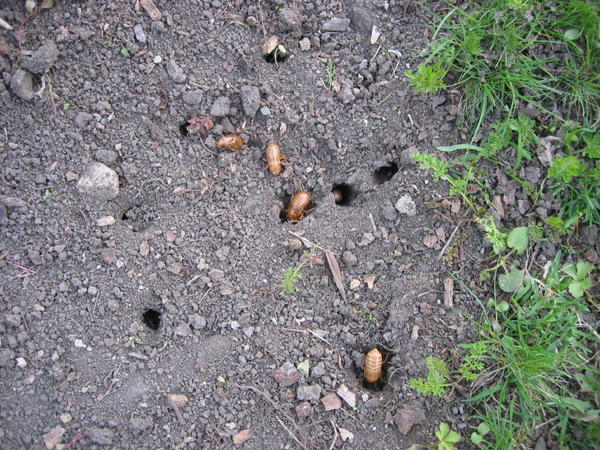 Whereas 17-year cicadas come out in a big style with a large population to harvest from, so it requires very little effort to locate and prepare them. Allegedly, Cicadas are supposed to taste nutty, I guess if they are roasted. I would imagine shells with chocolate are just that: shells with chocolate. May as well dispense with the shells and just eat the chocolate! I am always willing to try something at least once. I realize I will never hike up Mount Everest, but I can collect a few Cicadas! I guess we have to coordinate an event to take advantage of these tender dears when they emerge. Cathy2 wrote: I guess we have to coordinate an event to take advantage of these tender dears when they emerge. Chicago Wilderness Magazine has a great article about the upcoming "truly great event". Cicadas hit Cincinnai in 1970 and can still remember them quite well. First, there were HUGE swarms of the critters even in the inner-city. The noise was deafening - perhaps 2-3x louder than the normal midsummer's cricket sound. Second, they do a lot of damage to ornimental trees, especially fruit trees. We lost a pear tree and the apple tree was scarred for several years afterwards. See, that falls into the category of playing with your food. Yesterday while taking my daily survey of my yard, I moved a stone that was stunting a perennials growth. I found exit holes and for the first time this year a cicada. For the last week or so, there has been a growing population of exit holes, though this was my first sighting. I didn't see any climbing up the tree trunk. They anchor themselves to the tree, then proceed to climb out of their exoskeleton to ripen to maturity. Around 10 PM this evening, I went out to get the cat. I walked over to the same location to take flash photos of the same region. Roughly the same grouping was basking in the cool night air. I took a few pictures of the tree trunk to find nobody present. I will check in the morning. According to those in the know, my beasties don't know they are too early. May 22nd is their due date. Of course these guys may just tuck themselves back to earth for a bit more rest. Meanwhile the Lake County Forest Preserve has a bunch of imaginative programs featuring cicadas. If anyone sees articles on cooking cicadas, then please post links here. Excellent catch Cathy, with the cicadas pic. I've been sharp myself and seen nary a sign. Do we know for sure that these are the 17 year cicadas? I have seen a number of exit holes, but there are always some exit holes this time of year for other beetlie kinds of things. The only actual guys that I have seen are the usual guys that come up every spring. I am not sure whether they are technically locusts, cicadas, or beetles. I missed the last 17 year cycle, but if my memory serves, in my youth in Cincinnati when we had them, they were white and very soft when they emerged and climbed the trees (in their larval stage) and then fastened themselves to branches to harden and then emerge. Then again, that was a long time ago, and I could be wrong. The only thing that I remember for sure is the beady red eyes. I am a veteran of two cicada cycles. Regular cicadas I practically never see. These are quite an invasion. I don't normally find holes in my yard. I have lots! I live in the older part of town in a 100+ year old house, so the ground doesn't get very disturbed here. Kinda makes your mouth water, doesn't it? Do you mean to tell us you passed up a snack before the big meals to come later this month? Cathy, this may well have been linked to already but here's a recipe you might want to try: cicada-rhubarb pie, maybe the ultimate in seasonal desserts. I bet your family would really enjoy it. Rene G wrote: Cathy, this may well have been linked to already but here's a recipe you might want to try: cicada-rhubarb pie, maybe the ultimate in seasonal desserts. I bet your family would really enjoy it. And, Cathy, if the family is less than enthusiastic, you (aka Miss Snooty-Pants State Fair Champion Extraordinaire -- did I get that right?) should enter the pie competition this year. The rhubarb growers of Illinois need you to popularize their much maligned crop! Of course, it might be a little tough to get the judges to actually taste the pie. But you could certainly come up with a hell of a creative table setting that would shock and awe the 4-H set. Despite due diligence, I have yet to spot one of these beasties. I've seen quite a few possible exit holes. I refuse to bother the buggers and dig them up. 8 or 9 days to due date. jlawrence01 wrote: Cicadas hit Cincinnai in 1970 and can still remember them quite well.. I somehow remember them there in the later 70s: Our apple tree (never known for giving apples anyway) was eaten to a stick and I remember plugging my ears with pillows at night, the noise was deafening. I was, however, supplied with "jewelry" all summer long - the cases were everywhere. I snuck into the forest preserve late last night to check my potential exit holes. No jewelry! I'm taking a group of kids on a nature hike this weekend, so I'll be scouting paths later today. It should be hot. Maybe that will help. Marilyn, I'd love to stop by for some cicada. I can bring some hot salsa (which I think might also be good with cicadas). I heard a great story today. A friend's husband grew up in Canada who was acquainted with the native population. He saw these people catching cicadas in mid-air and throwing them directly into a stew pot. I love the visual image. Yes, I was living in Oak Park in 1990, and as I recall we had a decent crop. Yeah, I was in Oak Park in 1990, too, and also remember a bumper crop of cicadas. I don't remember tasting them, though. Although, when I was very young, I did try to eat a live crayfish. Those darned parents of mine stopped me, though. I am in. I do not want to spend the next seventeen years wishing I had tasted some cicadas. I will be happy to bring an appropriate dish to go with the cicadas once you have finalized your recipe. OK, we're on. In fact my pals at WTTW are going to do a little bit about it on Chicago Tonight if all goes well. My film-school-student daughter will be shooting the actual party, so please try not to barf on camera. I will be preparing: roasted cicadas, chocolate covered cicadas and battered fried cicadas. there are plenty of recipe suggestions out there and I'd welcome your bringing things, including appropriate wine. Check out the cicada mania site if you haven't yet. ... and I've yet to spot a cicada. It comes as no surprise to me that Cathy's cicadas are enterprising and filled with initiative while the cicadas by me are all a bunch of dilatory laggards. Urging them into action has not produced results. Still, I hope to spot some tomorrow on the nature walk with the kids. Imagine the tykes horror when I pop one of these buggers still wiggling into my gaping maw. I'll have to let you know about the party...gotta work up my courage! First LTH event *and* I have to eat a cicada? That is a lot of courage! I haven't seen a cicada in maybe a week. I think they made their exit tunnels, then went back to rest up for the big surge. Based on the article's conversation with the Botanic GArden, Josephine and I purchased tulle for our respective young and small trees. I hope to do this tomorrow and send along some pictures. Driving back into town this evening, I did see one tulle swathed young tree on Central Avenue in Highland Park by the pool. I smiled knowing they had heard the same information. Last edited by Cathy2 on May 20th, 2007, 7:27 pm, edited 1 time in total. christine wrote: I'll have to let you know about the party...gotta work up my courage! First LTH event *and* I have to eat a cicada? That is a lot of courage! If it's any added attraction, The Wife has agreed to roll some cicada maki for the event. A little daikon, maybe a steamed carrot, wasabi and a cicada rolled in rice with nori...I think that could work. Well, they have arrived in Flossmoor, although I did not see any near my house in Homewood. I stopped by my mother's house this afternoon and the trees are covered with the little critters. She said there have been a large quanitity of gulls swooping around the neighborhood and picking them out of her lawn. I hate them. The year we moved to Flossmoor from the city, the sidewalks were coated with them. I was scared to death, trying to pick my way around the neighborhood without stepping on them. The last time they were around, I was living in Homewood, about five minutes from my parents' house, and there weren't nearly as many, even though our house is much older than my parent's house, with much older trees. I'm hoping we luck out again this time. My kids say they won't visit grandma and grandpa until they are all gone. Cathy2 wrote: Driving back into town this evening, I did see one tulle swathed young tree on Central Avenue in Highland Park by the pool. I smiled knowing they had heard the same information. We've got a number of trees and shrubs swathed in lovely green tulle in our neighborhood. We recently planted a new magnolia in front of my house, but it's quite small and almost devoid of leaves. The guy at the nursary said not to worry about giving it the tulle treatment.